JACKSON, MS–Arkansas Pine Bluff came out with a strong punch offensively in the first half particularly with three-point shooting but Jackson State withstood the test with good defense and good shot selection as the Tigers pulled away in the second half, defeating the Golden Lions 65-52 Monday evening. JSU improves to 9-13 and 6-3 in the SWAC. 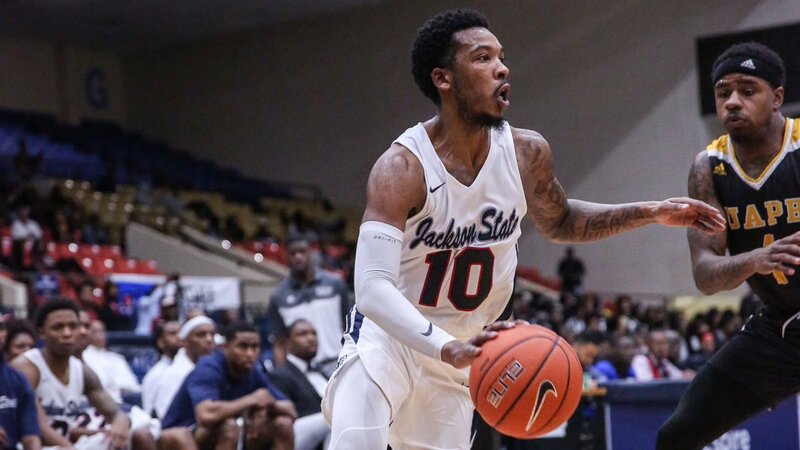 Jackson State (9-13, 6-3) earned its third consecutive win and secured its longest win streak of the season after beating UAPB. With the win, the Tigers sit in a three-way tie for second place with Texas Southern (11-11, 6-3) and Alabama State (8-12, 6-3). Texas Southern defeated Alabama A&M 84-74 while Prairie View A&M (11-11, 9-0) – the only undefeated team remaining in the SWAC – narrowly defeated Alabama State 69-67 Monday evening. Tigers’ Jontrell Walker, who put up a huge 15-point performance against MVSU on Saturday, led the team in scoring with 19 points off the bench, including 10-of-11 from the free throw line and 3-of-7 from three-point range. Two other Tiger players finished in double figures. Lemmie Howard finished with 12 points and four rebounds, followed by Dontelius Ross with 11 points and four assists. As a team, JSU shot 43.9 percent (18-of-41 shooting) from the floor, 45 percent (9-of-20 shooting) from three-point range and 71.4 percent (20-of-28) from the charity stripe. The Tigers outrebounded the Golden Lions 28-27 with forward Jayveous McKinnis leading the team with nine and six blocks. JSU also outscored UAPB in points off turnovers (27-12) and bench points (24-15). McKinnis stepped up big in the second half, saying his coach challenged him after having only one rebound in the first half. “It pushed me to get more physical and get more active,” McKinnis said. Golden Lions guard Martaveous McKnight — the SWAC’s leading scorer entering the game — was held to 12 points and seven rebounds with 11 of his 12 coming in the first half. McKnight averages 21.5 points per game. Behind Knight, guard Charles Jackson finished with 12 points, two assists, and two rebounds. UAPB shot 40 percent (18-of-45 shooting) from the floor, 41.2 percent (7-of-17 shooting) from beyond the arc and 56. 3 percent (9-of-16) from the charity stripe. Early in the second half tied at 36, Brent subbed in Jesse Love into the game, one the Tigers best defenders. The energy changed quickly in favor of the Tigers. “When we made the sub with Jesse Love and Jontrell, I thought that picked up the energy,” Brent said. JSU went on a 15-0 run in which Howard scored six of his 12 points to give the Tigers a 51-36 lead. The Lions fought back as they managed to cut the deficit to 10 with 2:40 to play but the Tigers were too much for them on both sides of the ball as their lead went back up to as many as 17 before winning by 13. The two teams exchanged baskets back and forth before UAPB took a 15-11 lead behind the shooting of Jackson and a layup by Terrance Bernard. Over the next several minutes, Walker hit two three-pointers to keep the game close as Lions used the three ball from Jackson and McKnight to maintain a three to a five-point cushion. Trailing 23-18, JSU went on an 8-3 run behind the play of Walker and Chris Howell as the game was then tied at 26. With 2:36 to play in the first half, both teams exchanged scoring possessions before JSU scored the final five points of the half that included a three-pointer at the buzzer from Ross to take a 34-28 at halftime. Tigers’ Dontelius “Peanut” Ross knocks down a 3ptr at the buzzer to give the Tigers a six-point lead at halftime. Jackson State returns to action on Saturday as the Tigers go on the road to face Alcorn State. Tipoff is set for 5:30 p.m.